Algae are tiny water plants that grow wherever there is still water, including your swimming pool. Bright green pool water is a sign you have an algae problem. Pool chemicals known as algaecides can treat or prevent algae growth. A popular type of swimming pool algaecide is based on copper compounds. Copper-based algaecides are effective and relatively inexpensive, but should be used with caution to avoid problems. Algaecides help keep pool water clear, but should be used with caution. A major problem with copper algaecides is that they can cause ugly green and black stains on pool walls and floors, says the LearnAboutPools.com website. These stains can become permanent if not cleaned off. Testing your pool water for proper copper levels and using products as directed can minimize staining problems. Copper concentrations should be kept below 0.3 parts per million, says the PoolSolutions.com website, or staining could result. Copper-based algaecides can't be used with polyhexamethylene biguanide-based pool sanitizers such as Softswim or Baquacil, says LearnAboutPools.com. Chemical reactions between the copper algaecide and sanitizer will neutralize the algaecide and cause cloudy pool water. 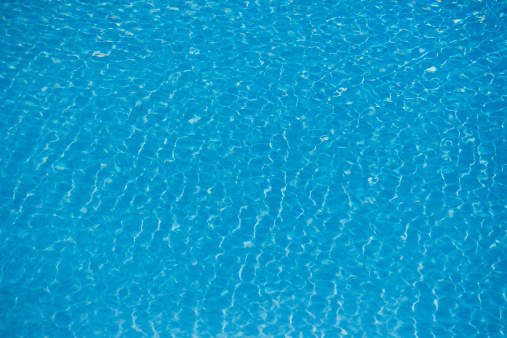 "Hard" water that's high in calcium and other dissolved minerals or water that's too alkaline can inhibit the algae-killing effect of copper algaecides while increasing the likelihood of pool stains, says PoolSolutions.com. Some stain-control agents also can impair copper algaecides' effectiveness. Does Copper Keep Pools Algae-Free?